Paulig Group is a family-owned, international enterprise in the food industry. Their portfolio includes strong brands such as Paulig, Santa Maria, Risenta, Gold&Green and Poco Loco. The Group has about 1,900 employees in 13 countries. They are working in four business divisions and common functions. Paulig has grown via acquisitions and they wanted to redesign their intranet structure to support productivity and their internal Paulig Way culture development towards ‘one company with several brands’ better than before. The intranet renewal was also needed to promote communality and sense of belonging, to create a more delicious visual look, to offer more efficient search features, and to ensure modern mobile availability. Paulig also wanted to find out whether the intranet implementation could be done by using the Office 365 cloud service that had already been implemented for document management, or if they should continue using Episerver. The project manager for the intranet renewal project, Piia Puska, and her associate in charge for the content update, Minna Olkkola, were thrilled about the successful project when we interviewed them a couple of months after the launch. – One of our values is “Grow Together”, and it was truly visible in how people throughout our organization were committed to the project. Over 100 people participated in the project at different stages, either via interviews, by working on the project itself, as participants in test groups, or by attending the editor training program. We were glad to have 13 people in our project team from all four divisions of our organization and from six countries we operate in. It is a true pleasure to work in a company with such a great spirit of collaboration, Piia Puska praises. – Approximately 130 employees throughout the organization have attended the editor training, and administrative rights of an editor are actively offered to everyone. We increased the number of content providers, and each function is now responsible for their own content. The project has proven the level of commitment of our workforce, and that they understand their role in the company’s internal communications that we all share. – Redesigning the content structure was a big change for us, since now the whole enterprise utilizes exactly the same structure. We offer country-specific information by using language versions. The challenge here is multilingualism. Offering just English is not enough. Some of the content is provided in the local language, since in addition to administrative workers, we also have sales and production personnel in several countries, describes Minna Olkkola. – We also wanted to have a simple structure, so we boldly divided the intranet into three main sections: News, Ingredients and People. – Furthermore, by leveraging HR data via integration, we are now able to offer targeted information for users, says Piia Puska. In the News section, the user’s personal ‘my news feed’ displays news that have been targeted by the user profile, and the ones the user has subscribed to. – The news feed is now more visual, since each item now includes a picture and an ingress text. It looks more like an online news site now. For the users, this has been a big change that takes some time to sink in, says Piia Puska. – In addition to actual news, we have company-internal Social Posts, where anybody working at Paulig may express their joy over small success stories of everyday life, or, for instance, share information and opinions about different events, Minna Olkkola describes. To set the social posts into motion, some example posts were made, and employees were encouraged to highlight things in life just like in regular, “external” social media. One of the challenges of an international corporation is the language barrier, which might even prevent the implementation of a functionality. At Paulig, the employee creating a social post may choose whether they want to target their content just for their own country in the local language, or if they choose to create the post in English and to share it for the whole personnel. It is also possible to use the familiar “like” and “comment” features. The second main section of the redesigned intranet, Ingredients, contains the so-called traditional intranet content types, such as those related to HR, sustainability, and tools. In Piia Puska’s words, “the ingredients that people at Paulig are made of”. The content may be customized for each country, based on the person’s HR profile. The third section, People, contains an index of persons which has been implemented by utilizing HR data integration. The index contains a personal profile for each employee, and the user is able to update the content personally if they desire to do so. A bit of spice is added by including a possibility for each user to set a personal background image. The intranet renewal project was launched in the last quarter of 2015. North Patrol partnered Paulig for the prestudy project, conducted in the winter of 2015–2016 as preparation for the renewal. During the prestudy, Paulig’s project team interviewed internal stakeholder groups in the guidance of North Patrol’s team. In addition to gathering information, the aim was to promote participation and commitment from the stakeholders. The concept design work, facilitated by North Patrol, focused especially on the views of different groups and roles in the personnel, as well as setting the goals for the intranet implementation. Based on the gathered data, the objective for the intranet redesign was supporting the company culture and strategy. This goal would be reached by streamlining the content structure and concept by bringing forward the business and especially the people behind it. The basic concept would be communicative-social, with the emphasis on news and multilingual content that could be targeted for different countries and divisions, as well as on visual appeal and the people. To meet these requirements, the best suitable technological platform of the available options would clearly be Episerver. – Well-made background work helped a lot during the actual project. We have often referred and returned to the goals and wishes we outlined. This work also had a very important effect on promoting participation, comments Piia Puska. After the preliminary study, Paulig continued collaboration with the vendor by concentrating on the visual concept. The intranet implementation partner of choice was Creuna, who began working on the project immediately after the summer holiday period of 2016. Agile methodology was utilized in the actual implementation work. Creuna was in charge for the intranet’s visual appearance and responsive user interface. Based on the content concept work, Creuna created the three-way categorization of the content types, which was beneficial for mobile use as well. – In the beginning of the implementation project, we collaborated closely with Creuna to define the scope of the implementation. Thorough groundwork was an important step for the latter stages of the project. Quality was the most important criterium for us, and the schedule would offer some flexibility when required. The all-new intranet was handed to us right on time for our Values Day, held on March 7, 2017, Piia Puska describes. Perform a thorough background research or preliminary study. This is when the organization’s personnel is encouraged to participate in the project. Trust your people, give power and responsibility on the intranet also for those outside the communications department. Put the communications personnel’s focus on training and support. Set unambiguous goals, and agree carefully with the vendor partner on what you are doing, and how it will be done. Make sure that both parties have a shared understanding on the objectives of the implementation. Allocate enough internal work time. In our project, communications, HR and IT teams worked closely together. The project was divided into three areas: technical, content, launch. All of these areas had a person in charge, and several functions of the organization participated in creating content. Be bold! In our project, on example of this would be that we were one of the first companies to adopt Episerver’s new cloud services. 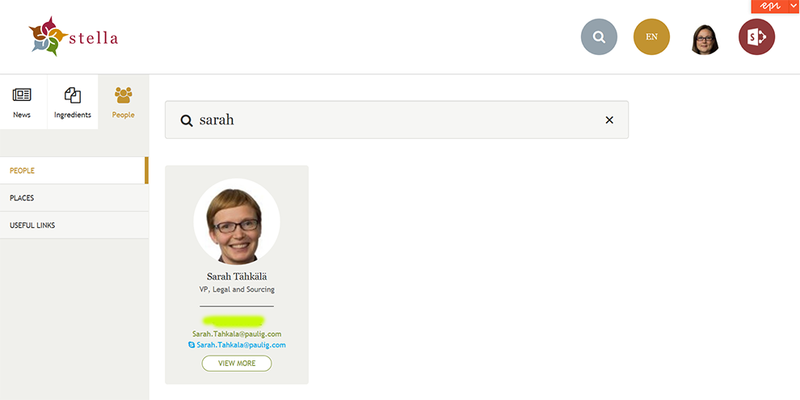 Additionally, we implemented a new method of user profiling within our company. Before the tightly-scheduled project starts, it is a good idea to check on how your background information systems are working. PS: Piia Puska will held a case presentation about Stella intranet in Digitaalinen työympäristö (Digital Workplace) conference in Helsinki 28.9.2017 (conference mostly in Finnish).